Since 2011, we’ve received over 50 American Advertising Federation ADDY’s and special recognition designations from Best of Show, Overall Body of Work to Judge’s Choice Award, and Best in Print. Other organizations have awarded our team, including Higher Ed Marketing, Collegiate Advertising Awards and Higher Education Awards. This website serves as the central source of information and insights into the SAEM/AISS division, which is responsible for recruiting, retaining and graduating career-ready students. We helped give a fresh look and improved functionality to the UA Office of Admissions website, which provides future Wildcats with important information and drives them to apply to the UA. This animated holiday e-card sent to all enrollment management student populations features Wilbur overlooking a wintery Tucson landscape. Housed at the Student Union Memorial Center in a former testing space, the multifunctional space serves as the hub for 100% Engagement on campus and includes a reception area, offices for staff, and a lounge used for workshops and student gatherings. The design won a gold ADDY in 2016. Screen graphics, scripts, RSVP systems, oh my! It takes an army to put on the UA’s Commencement ceremony year after year. Luckily, our office is filled with trained soldiers who are dedicated to making it an unforgettable night. It's impossible to miss the bright, eye-popping design of The Counter, a compact eatery designed for Arizona Student Unions. Located outside the Eller College of Management, it provides tasty sandwiches and coffee to hungry (and decaffeinated) students. The Counter's design received a Gold ADDY in 2015. This piece was designed for the Dean of Students office to help increase the visibility of cultural and resource centers for students, highlighting the various communities on campus. The UA isn’t like other colleges. That’s why our freshman recruitment packet is unlike any other. These materials, sent to prospective UA freshmen, outline all of the reasons to become a Wildcat while featuring exciting design and breathtaking photography. This invitation designed for Fraternity and Sorority Programs at the UA encouraged campus and local community members to celebrate a century of Greek life at the UA during Homecoming 2015. There are certain things you should do in a job interview, and certain things you should definitely never do. This promotional video created for Career Services highlights a few of the latter. From the beautiful campus to unbeatable opportunities, life at the UA is totally awesome. These animated videos are designed to get admitted students excited about becoming Wildcats and encourage them to commit to the UA by signing up for New Student Orientation. Sure, Commencement is a night celebrating graduating Wildcats. But it’s also about the families and loved ones that helped them get there. 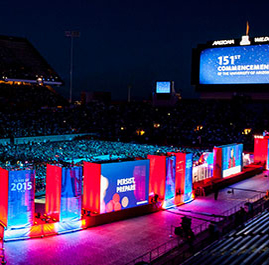 This video was produced for the 151st Commencement ceremony. We dare you to watch it without tearing up. "I love working with Marketing! They never openly mock my own design attempts and always know where exactly you need to add some triangles!"